Following global faculty and trustee meetings, President Lee C. Bollinger '71LAW spent the afternoon of Sunday, March 5, 2017 at the Tate Modern for a special Columbia program. Following global faculty and trustee meetings, President Lee C. Bollinger '71LAW spent the afternoon of Sunday, March 5, 2017 at the Tate Modern for a special Columbia program. A select group of attendees, including CUCL Board members, enjoyed small group tours led by Tate Modern exhibition experts. Highlights included Kader Attia’s Untitled (Ghardaïa) town sculpture composed entirely of cous cous along with a few of Louise Bourgeois' infamous spiders. Chair of the University Board of Trustees, Johnathan Schiller '69CC, '73LAW introduced fellow trustee Claire Shipman '86CC, '94SIPA, current senior national correspondent for the ABC program, Good Morning America, who put Bollinger in the hot seat regarding the shifting journalist landscape and the role Columbia should play within a dynamic political climate. In classic British fashion, the afternoon was capped with high tea, champagne and networking. 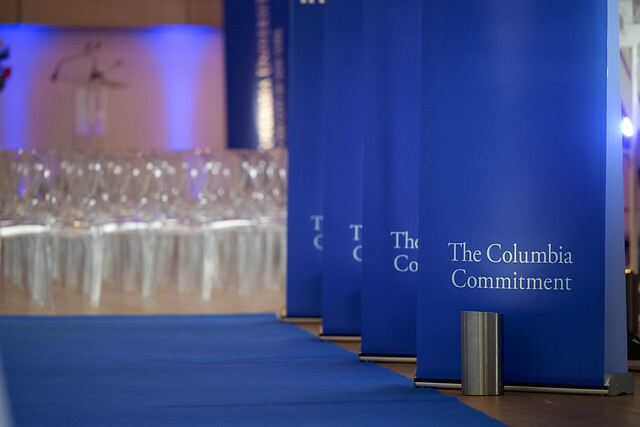 We look forward to future London visits from Columbia trustees, staff and faculty.